Population: 1,582,700, mainly Uzbek (32.8%) and Karakalpak (32.1%). Central Asia covers an essential part of the Asian part of the planet. Its area makes up more than 1295 thousand square km, which is larger than Germany, France and Great Britain in total size. Central Asian territory spreads from the Caspian Sea on the west to the borders with China on the East and from the Aral-Irtysh watershed in the north to the border with Iran and Afganistan in the south. Its western and northern regions are represented by vast valleys, deserts and dry steppes surrounded by the Pamir-and-Alay and Tien-Shen mountain ranges on the east, some of whose peaks are the highest in the region and reach 7.5 km above sea level. Nevertheless, Central Asia is far from being just a geographical definition. Primarily, it is a large historical and cultural region, having a twenty-five century long history. It's a region with an ordered particular historical and cultural community, different from that of other regions. The following republics are included in Central Asia: Turkmenistan, which spreads from the Caspian Sea to the middle reaches of the one of the largest central Asian rivers, the Amu-Darya (Vakhsh in ancient times, Oxus in Greek, and Jeihun in the Middle Ages); Karakalpakistan, within the Republic of Uzbekistan, located on the lower part of the Amu-Darya river; Uzbekistan covers the central part between the two rivers (named as Maverannahr in the Middle Ages) i.e. the lands between the two biggest central Asian rivers, the Syr-Darya and Amu-Darya. Tadjikistan is situated to the south-east and Kyrgyzstan to the north-east. During its centuries-long history, the region was firmly connected with the lands of the present Southern Kazakhstan in terms of history and culture. The desert areas of Central Asia are characterized by a continental climate and intensive insulation, extreme air aridity, and little precipitation. Its remoteness from any oceans, the major source of humidity, little atmospheric precipitation, high summer temperatures, and prolonged dry periods have caused the formation of the vast desert regions here. The Karakalpakistan border is located on the Turan lowland. Kara-Kum desert is on the south-west, and Ustyurt plateau is on the north-west; Kyzyl-Kum desert is on the north-east. He Karakalpakistan territory comprises the southern half of the Aral sea, a new saline desert Aral-Kum is being formed on its dry bottom, and the lower part of the Amu-Darya river. The deserts in Karakalpakistan cover 13.67 million hectares, which is more than 80% of its territory. The Aral Sea environment gradually and slowly evolved and was the location of the Mesozoic-Kainazoi seas, precipitation and alluvial layers accumulation brought from the mountains. This caused the formation of the vast bedded and alluvial plains. The cretaceous tertiary and quaternary deposits took part in their formation. Cretaceous rocks were formed by the sea and continental formations, represented by sand and clay in the Tokmakata, Kulandy peninsulas, Aktumcyk cape, Beltau, Kuskanstau, Sultanuizdag, and other Paleozoic and secondary layers and crystalline rock outcrops. The north-western parts of the desert are much younger in geological terms, i.e. the Ustyurt plateau is of the late tertiary period. The Barkhan sands represent a typical desert illustration. The territory of the present republic of Karakalpakistan is a kind of "Archeological reserve". 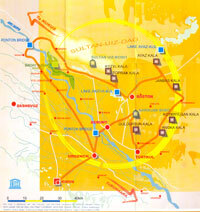 More than 300 archeological sites are located there. This place was called Khoresm in ancient times. Khoresm is the state which existed during the ancient and medieval periods on the lower reaches of the Amu-Darya River on the territory of the modern republics of Uzbekistan and Turkmenistan. The Khorezm Archeological and Ethnographic Expedition, led by S.P. Tolstov contributed greatly to this geographic history study. 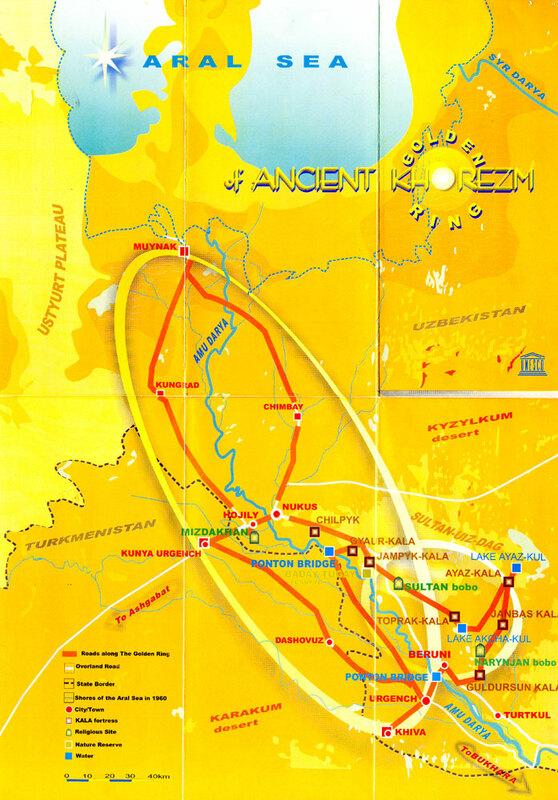 Having started the work in 1937 on the lower regions of the Amu-Darya and Syr-Darya rivers, and on the adjacent parts of the Kara-Kum and Kysil-Kum deserts, the expedition discovered and studied a great number of archeological monuments of different eras, from the Stone Age to the late Middle Ages. That enabled them to deduce the general the history and culture of the Khorezm inhabitants, and that of the whole south-eastern Aral Sea region. The most ancient sites of primitive people, revealed in the Khorezm oasis and the adjacent desert regions, are related to the Late Stone Age epoch (6-3rd millenniums BC). Tribes of hunters and fishermen lived here in large ground-based dwellings of wire-frame construction, covered with bark and reeds. The Khorezm ethnic community originated with the complex processes taking place in the Bronze Age, such as the assimilation of the local population with foreign cattle breeding and agricultural tribes from the Eurasian steppe zone, and the constant infiltration of various population groups from the southern regions of Central Asia. It was under the influence of the southern regions that by the middle of the second millennium BC, irrigated agriculture had developed on the lower Amu-Darya River. This was the time of the steppe Bronze Age culture formation. Irrigation-based agriculture had become predominant here. The further irrigated agriculture development was characteristic of the era of the Late Bronze Age, represented by the Amirabad cultural monuments (10-8th cc. BC).Semi-dugout huts began formation of the settlements consisting of 15-20 houses. The first craftsmen then appeared. The primitive community decay process was intensified. Society property differentiation enhanced. 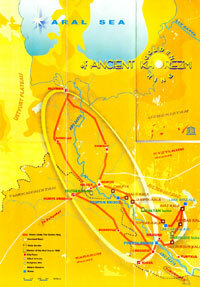 The formation of proper Khorezm civilization was related to the so-called archaic culture (7-5 cc. BC) represented by monuments like the Kyuzeli-gyr site and Dingildzhe farmstead. 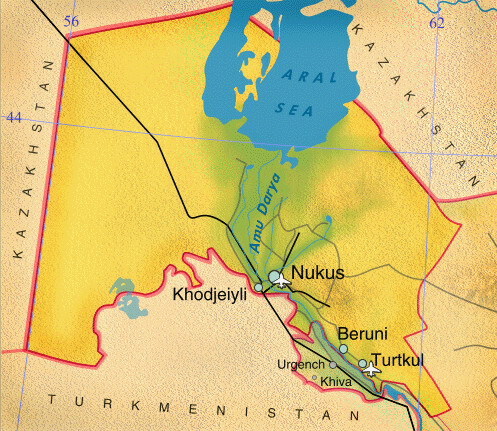 Further irrigated agriculture development, connected with the construction of the big diversion canals by that period was one of the important factors contributing to the Khorezm State system formation. Fortified city type settlements and multiple country farmsteads appeared. It was in the middle of the 6th c. that Khorezm was conquered by the Akhemenides. The country was involved into intensive cultural exchanges. Between 5-4th c. BC Khorezm gained independence and kept it all through Alexander the Great's eastern campaign and the Greco Macedonian tsars ruling in Central Asia. In 4-3rd cc. BC the Khorezm people created their own special art culture through the synthesis and development of local and borrowed elements. The burial mounds of the Sarykamysh delta are evidence of the contacts of Khoresm's western province's population of Sarmat cultures. The Khorezm Afrigid culture of the early Middle Ages (5-8th cc. ), formed on a local basis under the influence of partly nomadic tribes, differs much from that of its predecessors. By the end of the Afrigid period, especially after the Arabic invasion in the 8th c., Khorezm art and culture started acquiring an image common to all the countries within the caliphate, while still preserving some traditional features. In the epoch of the Great Khorezm Shahs, who created a vast empire between the 12 - 13th cc. from the Indian border to the Caucasus, a great artistic and cultural upheaval was observed. The power and glory of that epoch was reflected in the construction of the main social and religious buildings, decorated splendidly with carved alabaster, murals and slip glaze slabs, as well as further craft development. Progress in ceramic crafts was represented by colored glazing improvements and the use of the potash slip, producing half-faience dishes. After the Mongols invasion in the 13th c. Khorezm became a part of the Golden Horde and influenced greatly the culture of the latter. Urgench, the capital of Khorezm, located on the caravan cross roads connecting the Volga river region cities and Central Asia, was one of the biggest crafts centers of Central Asia. The ceramics of that time represent a variety of artistic methods: underglaze and overglaze painting, relief, engraving, and punch. The vegetable pattern predominated among ornamentation motifs. Zoomorphism could also be seen occasionally. Colored glass decorations were varied and richly ornamented as usual. Exhibits stored in the vaults of the archeology department of the State Arts museum named after I.V. Savitsky and in the Institute of History, Archeology and Ethnography of the Karakalpakistan branch of the Academy of science of the Republic of Uzbekistan are of great interest and enable archaeologists to trace back the history of culture of the Khorezm oasis and the neighboring regions through the millennia. The artistic content and style of the region were altered to a certain extent under the influence of social, economic and ethno genetic, as well as ideological factors. Khorezm art developed in close connection with the cultures of neighboring countries. Growth and collapse were often brought about by violent political events. Still, many local cultural features appeared to be stable and have been preserved until the present day in the applied arts and folk architecture of the modern population inhabiting the territory: Karakalpaks, Uzbeks and Turkmens. In Karakalpakistan you can find beautiful, varied landscapes and the magnificent ruins of historical monuments and archeological sites. Ayaz Kala, series of three fortresses 2nd-7th cc. Ayaz Kala is located on three levels on the Eastern side of the Sultanizdag mountain ridge. Ayaz-1, built on top a red rock, with a steep bank falling to the ancient delta of the Amu-Darya river, is the oldest part of the series. At its foot lay the Palace of King Afrig (Ayaz-3), from where a ramp led up to Ayaz-2, the citadel that protected the palace. Until the 7th century, the entire fort served to the population of the fertile planes in times of attacks and warfare. Angka Kala, fortresses 3rd-5th cc. This is a good example of the Late Antique defence architecture of Ancient Khorezm. The square shape of the plan is central-symmetric and well preserved. The site is a fortified town, with Double walls and large rectangular towers located in the corners and the middle of the fortress, which served to protect the large, densely-populated oasis during many centuries. This circular fortress is unanimously considered by scientist to be a cult structure used for astronomical observations of the sun and the stars. At the time, the Sun and Water cult prevailed and particular devotion was rendered to the Formalhaut star (in Arabic: 'waters edge') the alpha star of the Southern Pisces constellation. Today we can see only insignificant fragments of the concentric circles of this most mysterious and unique monument of Ancient Khorezm. The Toprak site of ancient cities is located on the territory of the Ellikkalin region of the Republic of Karakalpakistan. It was discovered in 1938 by S.P. Tolstov. In the year 1940 the first excavations were carried out. The digs were conducted until 1992. This site covers an area of 500x350 meters. Being of a rectangular shape on the plan, it is surrounded by fortress walls preserved in their rampart shape, which are 8-9 meters high in some places. It was determined that one of the blocks housed temples which were traditionally built here throughout the city's history. Rams' horns decorated with gilded bronze rings were found in another building. There were multiple gifts scattered about: glass vessels, decorations, alabaster sculpture fragments and many murals depicting dancing fantasy masks. Also uncovered were warriors' figures in the warriors' hall and Tsars' sculpture figures made of unburned clay in the Tsars' hall. Kyzyl Kala, 1-2nd cc., 12 - beginning of 13th cc. The fortress is located 27 kilometers to the north of Biruni city. The monument was first discovered in 1938 by the HAEE workers. The fortress is located in a valley and has a square shape with the dimensions 65x63 meters, its corners oriented to the four directions of the world. The outside wall was incised with two circles of lancet loopholes. It was apparently built as a defensive fortress, and was included in the line of Khorezm fortifications created by the government to protect the ancient Khoresm north-eastern borders. At the same time, the fortress was the center of an agricultural region and a junction on the caravan routes through the Sultanuizdag mountain range. It is located on the north-western mountainside of a barren rocky cliff, enclosing a ridge stretching to the south-east from Sultanuizdag. In the years 1946-48, the first picture of the fortress was made from the air. It is of a rectangular shape, with the dimensions 200x170 meters. The materials collected from the site are mainly represented by ceramics, which are characteristic of the early Antique (Kangyui) culture of Khoresm. The Big Guldursun, a fortress from the 3-4th cc. BC, 12-13th cc. AD. Located 20 kilometers to the east of Biruni city. It was first studied in 1937 by the archeologist A. G. Gulyamov, and in 1940 the investigation was continued by S.P. Tolstov. Finally, from 1987-1994 it was completed by I. O. Dospanov. The Big Guldursun is one of the largest Khoresm frontier fortresses. It was built on the basis of the desolate ancient fortresses. It represents an irregular rectangle with the dimensions 350x230 meters, with the corners oriented to different parts of the world. A great number of pieces of antique and Middle Age ceramics, bronze articles and decorations, as well as antique and medieval coins were found inside during the archeological excavations. The coin discoveries are evidence to the fact that the last period of the monument's habitation is related to the year 1220, i.e. to Muhammed Khoresmshah's rule, or to the time of the Mongol invasion of Khorezm. Mizdahkan (Gyaur Kala of Hodjeily). Archeological and Architectural complex, 4th c. BC- 14th c. AD. The archeological complex of the ancient Mizdahkan is located on a vast zone covering over 200 hectares along the big arterial routes on the way to Kunya-Urgench (Turkmenistan) and to the northern regions of the republic of Karakalpakistan - Kungrad and Muinak and to the Ustyurt plateau. The main parts of it are situated on the three hills on the south-western outskirts of Hodjeili city. It includes the Gyaur Kala fortress, Shamun nabi, Mazlumhan sulu, and Halfa Yereshep mausoleums and Caravanserai. Unique ossuaries, coins, various domestic utensils, glass, and highly artistic golden articles were excavated. The mausoleum is located in the western part of the northern half of the cliff. Half of it is underground. Only the cupola and the entrance portal are seen above the ground. A staircase leads down through the vaulted corridor from the portal to a small cupola structure. Another staircase leads down to the central room. Data from coins found here shows that the mausoleum construction dates as far as the 14th c. It's connected with the trading cities of the Golden Horde and Khoresm's rise. Mizdahkan was one of these, located on the brisk international trade roads. Chilpyk. A cult structure of the 2-4th cc., 9-11th cc. AD. Chilpyk, of a circular construction, is located along the highway 43 kilometers to the South of Nukus (on the way to Khiva, Samarkand, and Tashkent) on the edge of a conical 35-40 meter high hill. It has the shape of an open-ended circle, 65-79 meters in diameter. The walls are 15 meters high. In the 2-4th cc. it was constructed as a Zoroastrian Dahma. In the 9-11th cc. local citizens used it as a signal tower. Djanpyk Kala. The site of ancient cities of the 9-11th cc., and 13-14th cc. AD. 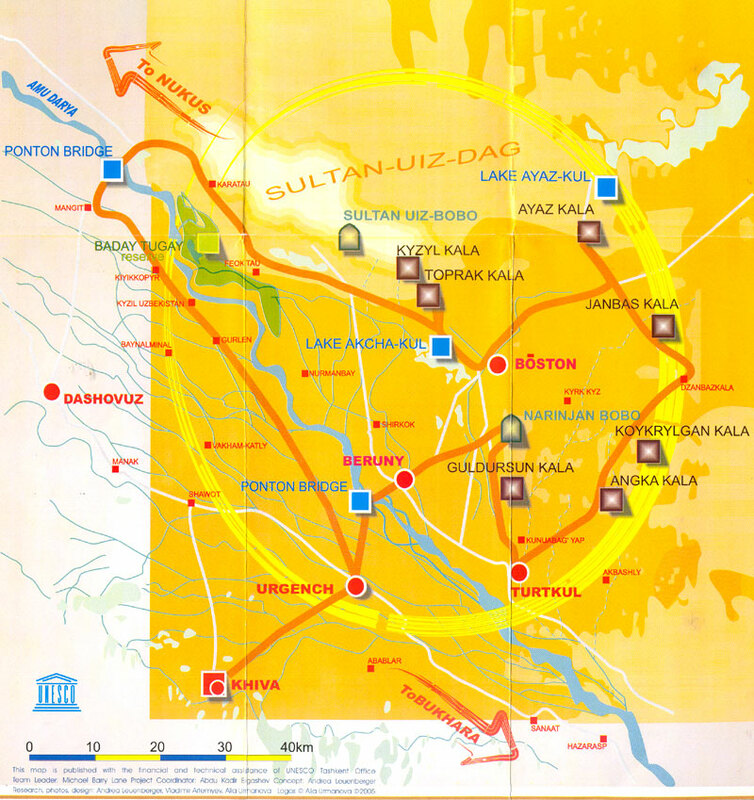 The site of ancient cities is located 6 kilometers to the south-east of Karatau settlement, on the south-western spurs of the Sultanuizdag mountain range. It's one of the picturesque monuments of the right-bank of the Amu-Darya river. The site has a complex configuration. The citadel has been preserved in the eastern part with a rectangular shape. The walls are decorated with close semi-columns, and the tops are finished with stepped arcs in pairs. These archeological excavations provided an idea of the site's chronology. The ancient ceramics date to the 4th c. BC - 1st c. AD. The date of the latest habitation has been determined by the coins found at the excavations, and traces back as far as the years 1319-1320 and 1345-1346. Numerous artifacts brought earlier from different oriental and European countries (China, Egypt, Russia, Europe, and India) were revealed at the excavations. The site of these ancient cities was used as a port in the Middle Ages. One can see endless vast expanses of the Badai Tugai reserve on the outskirts of Djanpyk Kala. Sultanbobo, Islamic religious site 15th-19th cc. This holy place and grave site tucked away in the Sultanuisdagh was given the name Uvais-Khan ibn Shir Ali-Oglan by local legend. The Khan, a zealous Muslim and brave warrior, was elevated to sainthood. He died in 831 Hijra (1428 A.D.) today this is a place of pilgrimage for Muslims from the larger region. Narinjanbobo, Islamic religious site 10th-15th cc. This was formerly a small town next to the ancient Gavhor channel. Nearby, on the hills by the ancient palace, Sheikh Imam Mukhammad ibn Musa ibn Daud Abu Abdullah al Naarinjan was buried. In the Nukus museum you find a clay plaque bearning a description of his life and the date of his death 310 of the Hijra (922-923 A.D.). His Gurkhana (mausoleum) was build in the 10th centure. As the city grew in size and prosperity, the holy pilgrimage site was beautified, a headstone with floral carvings was placed over the drave. Naringanbobo still draws pilgrims from all over modern Khorezm. Floating passage across the Amu-Darya river, the legendary Oxus of the Greek Saga to the Ellikala oasis. River boating in season and by request fresh fish fried on board while you enjoy the breeze. Amu-Darya river crossing with a view onto Chilpyk and Sultanuizdag on the eastern horizon. Enjoy freshly caught fish in one of the Chai-Khanas or stop for sunflower seeds to nibble on. Ritual jewelry of the Karakalpak women in the 19th - early 20th cc.